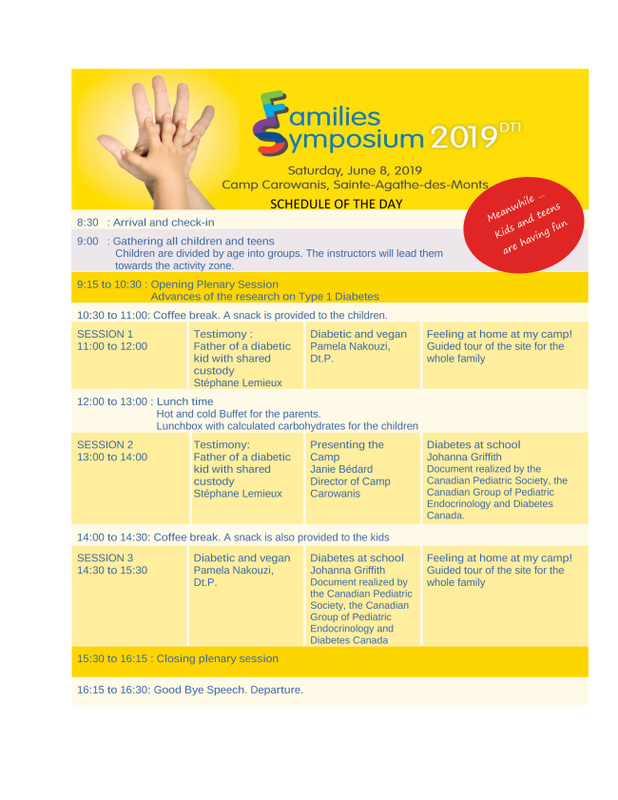 The two in one formula combining Families Symposium and the Open Doors event for the Camp is back bringing its share of conferences and workshops to help parents know more about actual trends and their impact on their children’s diabetes. No need to say that this special event would be incomplete without extra fun for children and teens. We would like to invite you to join Fred’s and Camp Carowanis’ teams for the 8th edition of the Families Symposium that will be held on June the 8th at the enchanting site of the Camp in Ste-Agathe-des-Monts. Round-trip transportation from Montreal to Camp, located in Ste-Agathe-des-Monts, is available – free of charge. Please note that seats are limited so….first come, first served! Workshops and conferences that will be held by health professionals in pediatric diabetes and interveners, are on schedule to keep you informed about Diabetes management on a daily basis. You will also be able to listen to an inspiring testimony of a parent and will be able to share with other families. Representatives from the diabetes pharmaceutical industry will be on site to answer your questions, should you wish to visit their booths. Meanwhile, entertainment is on schedule for the children and teens with the Camp Carowanis’ staff. It is a not-to-be missed event! Subscribe before May 10 to benefit from special rates. Fred is looking forward to greeting you at Camp Carowanis on June 8, 2019!